Fairtrade. Extraordinary coffee. Strength - 3. 100% Arabica. Natural & smooth.Delicious Decaf Naturally decaffeinated, our Colombian coffee is bursting with flavour. It's well-rounded and velvety smooth with a caramel finish. 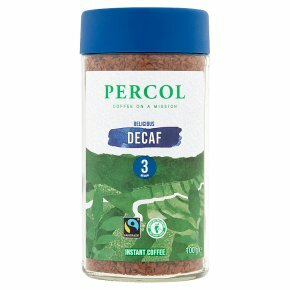 So tasty, you'd never know it's decaf. Making the Perfect Coffee We recommend using one teaspoon of coffee per cup. If you like it a little stronger, add a little more. Pour in hot water just off the boil and stir. Finish with milk and sugar to taste.